The Parish Church of South Marston is part of the Stratton St. Margaret Team. The Church office for South Marston is located at St. Margaret’s Church Centre, Kenwin Close, Stratton. Office hours are: Tuesday, Wednesday, and Thursday mornings from 8.30 am – 12 noon, email stmargaretsoffice@tiscali.co.uk or tel 826505. All enquiries for christenings and weddings should be made to the Rev Vicky Fleming on 827021. Tel: 01793 826505. All enquiries for christenings and weddings should be made to the Rev Vicky Fleming on 827021. The meeting point is a monthly coffee morning with table top sales held at the Village Hall. Homemade cakes, tuck shop, gifts, card, Fairtrade items – there’s always a variety of different things to see and buy each month – and you never know who you might meet. £5 if you live in the village. £10 if you live outside the village. 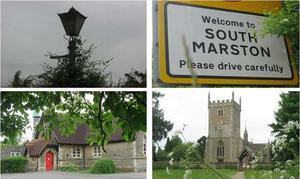 Welcome to the new and improved South Marston Village Website. This website supports community groups and businesses in South Marston. – Browse the Menu to the right for group specific posts. – Visit the calendar to see upcoming events. – Register to receive email updates of new website posts. – *NEW* View the website on your Mobile Phone. We hope you find it useful – and would welcome your comments and feedback on anything related to this site, its contents or South Marston. If you would like to contribute to the website, then contact the webmaster. Our first attempt at a club holiday was a success; everyone indicated they were glad they signed up to go. The holiday base was Rhyl in North Wales. The weather was fine and the hotel adequate. Trips out were to Betws-y-Coed and Chester. The trip home was over the Horseshoe Pass to Llangollen.